* Annual Percentage Rate (APR). Rates and terms effective as of 4/1/2019. Advertised rates and terms are subject to change without notice. Additional terms and restrictions apply. Other loan rates available. Subject to borrower qualification. Advertised rate assumes a 0.25% discount when you set up automatic payments from any checking or savings account. Offer valid on personal vehicle loans only. Criteria to receive the stated APR: Loan term 48 months or less and vehicle model 2018 and 2019 new or used models, with an excellent credit score. Borrower pays any closing costs. Auto Club Trust, FSB uses a managed credit program and final APR is dependent on your credit score, down payment, and loan term. An auto loan with an APR of 3.14% for a $35,000 loan at a term of 48 months, your monthly payment would be $776.87. No private party sales will be financed. Products are offered by Auto Club Trust, FSB, Equal Credit Opportunity Lender. An auto loan through AAA could save you hundreds of dollars. 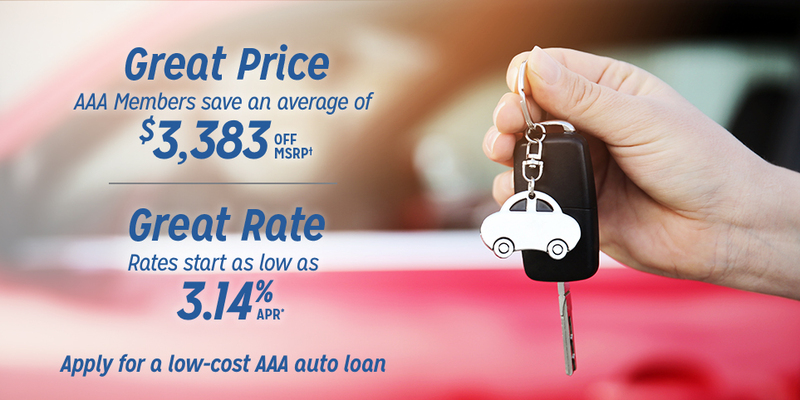 Finance a new or used vehicle for as low as 3.14% APR*. Research tools like CARFAX® and crash reports put you in the driver's seat. Learn more about auto insurance through AAA. Learn more about driver safety and training courses in your area or online. Learn about and order your International Driving Permit. Our AAA Mobile Battery Service will test and jump your battery free of charge or replace it at a discounted rate. Looking For a Reliable Repair Shop? Approved Auto Repair shops have the AAA seal of approval. AAA offers a variety of services to help you save time and money, purchasing and maintaining your next vehicle. We’ll be there — anytime, anywhere, any day of the year. To request service you must have a valid membership card, picture ID and be with the vehicle. On Google Assistant, say "Talk to AAA Road Service" and be connected for non-towing light service requests. † Between 7/1/17 and 9/30/17, the average savings off MSRP presented by TrueCar Certified Dealers to users of TrueCar powered websites, based on users who configured virtual vehicles and who TrueCar identified as purchasing a new vehicle of the same make and model listed on the certificate from a Certified Dealer as of 10/31/2017, was $3,383. Your actual savings may vary based on multiple factors including the vehicle you select, region, dealer, and applicable vehicle specific manufacturer incentives which are subject to change. The Manufacturer's Suggested Retail Price ("MSRP") is determined by the manufacturer, and may not reflect the price at which vehicles are generally sold in the dealer's trade area as not all vehicles are sold at MSRP. Each dealer sets its own pricing. Neither TrueCar nor Auto Club Trust, FSB, sells or leases motor vehicles. Member Savings currently not available in all states. In these states a "Target Price" is presented, which reflects a market-based example of what you can reasonably expect to pay for a vehicle configured with your desired options. Your configured vehicle may not be available or in-stock at the Certified Dealer.